A great starting spot for those who are new to Marty and programming in Scratch. Addresses the Second Level Technology Benchmarks in the CfE. The next step for budding programmers to get to grips with new coding concepts in Scratch. Addresses the Second Level Technology Benchmarks in the CfE. Continue to learn with our second programming concepts lesson pack in Scratch. Addresses the Second Level Technology Benchmarks in the CfE. 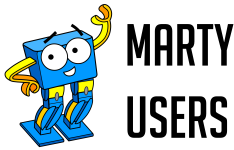 Learn about robotics and sensors Marty has and explore interacting with the world with Scratch. Addresses the Second Level Technology Benchmarks in CfE. Learn about how to use your BBC Micro:Bit along with your Marty and continue to explore physical computing with Scratch. Addresses the Second Level Technology Benchmarks in CfE. Supporting students moving from block-based to their first text-based programming language. Addresses the Second/Third Level Technology Benchmarks in CfE. Introduction to programming Marty the Robot using Python. Addresses the Third/Fourth Level Technology Benchmarks in CfE. How do we program robots to make decisions with Python? Addresses the Third/Fourth Level Technology Benchmarks in CfE. Get to grips with using loops to control Marty's actions. Addresses the Third/Fourth Level Technology Benchmarks in CfE. You can change your mind at any time by clicking the unsubscribe link in the footer of any email you receive from us, or by contacting us at hello@robotical.io. We will treat your information with respect. For more information about our privacy practices please visit our website. By clicking below, you agree that we may process your information in accordance with these terms.